New York seems to be having a seasonal identity crisis. We had a few days of spring-like temperatures, and then fell back into something resembling winter again. No matter the weather, this time of year always has me thinking of light, fruity desserts. This recipe came about as I was contemplating how to make a lemon dessert without it being so lemon-y that I wouldn’t like it. I’m more of a citrus-in-small-doses fan. I decided to add blueberry to the mix to make things a bit more interesting. Let’s start at the bottom of all of this with the crust. I opted for a bit of a nontraditional route by not using a graham cracker crust. Instead, this crust is a tasty combination of butter, brown sugar, and pecans. 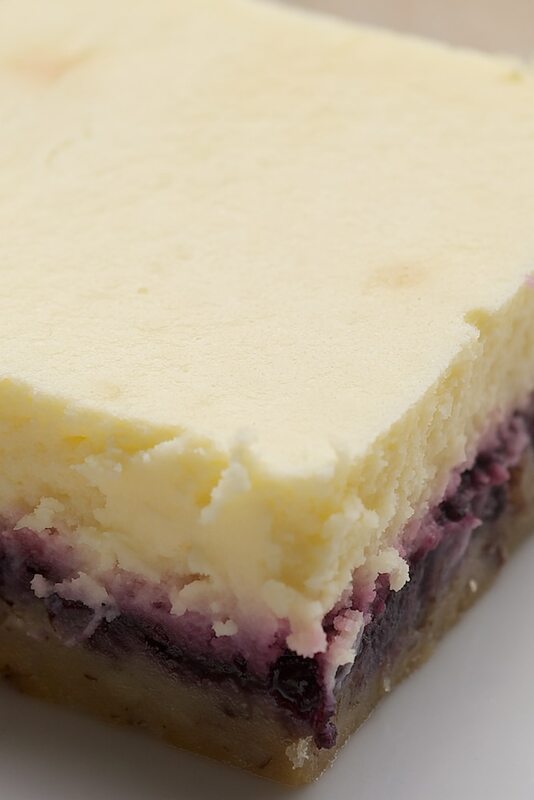 That is then topped off with blueberry preserves and a lemon cheesecake filling. This is a great recipe for customizing to your flavor preferences by using a different flavor of preserves, or by omitting the lemon juice or using a different juice or extract. You can also go a bit more traditional with a graham cracker crust like this one. However you make it, this is one of the easiest ways to get to your cream cheese-y reward. It certainly satisfied my hankering for something befitting springtime. 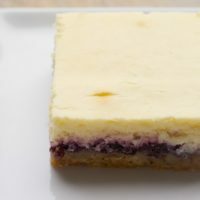 Lemon Blueberry Cheesecake Bars combine a nutty crust, blueberry preserves, and a lemony cheesecake for an irresistible dessert. Combine all the crust ingredients using a fork or your hands. Press evenly into the prepared pan. Bake for 15 minutes. Spread the blueberry preserves evenly over the slightly cooled crust. Using an electric mixer on medium speed, beat the cream cheese and sugar until light and fluffy. Add the eggs, one at a time, mixing well after each addition. Add the lemon juice and vanilla extract. Mix until smooth. Pour the filling evenly over the crust and preserves. Bake 40-45 minutes, or until set. Cool in pan on a wire rack for about an hour. Refrigerate for at least 2 hours before cutting into bars.